a common inquiry made in order to learn about a person's ethnic background or identity. What’s the intent behind a simple question like, “What are you?” Examine the legacy of this question throughout history and how we perceive (and count) who belongs to which race from three unique points of view. Journalist Soledad O’Brien discusses the limitations of racial classification. What do you hear when someone asks, "What are you?" How would you describe microaggressions? Use the hashtag #WhatIHearPBS to share your thoughts. 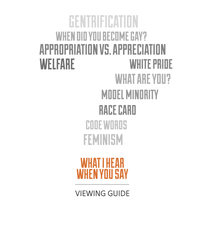 Dig deeper into the conversation with a detailed Viewing Guide: What I Hear When You Say: What Are You.